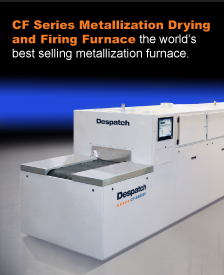 Minneapolis, Minnesota, USA, February 14, 2017 – A second customer evaluation of the Despatch Split-Zone™ Oxidation Oven was recently completed. The results confirm that the new oxidation technology provides a significant reduction in cycle time. The customer, a large North American based carbon fiber producer, reported that they could have up to 20% higher speed and throughput using this system. Half of the increase is directly related to longer heated length and the rest attributed to the split zone and temperature uniformity compared to their existing production line. An earlier customer test conducted using premium grade precursor achieved the target density in just two zones with a dwell time of 44 minutes, a reduction in cycle time of nearly 35%. A white paper is available on the Despatch website with complete details on this customer evaluation. 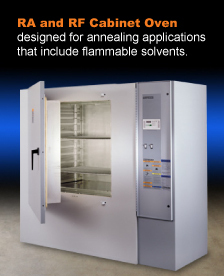 Patent protection is pending for the Despatch Split-Zone™ Oxidation technology. This patent applies to the split zone control which provides two discrete thermal profiles for the upper and lower half of the chamber. 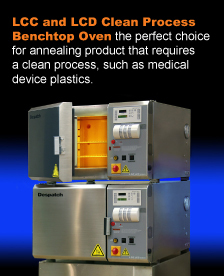 Separate plug fans and controls allow you to increase the temperature in the upper half of the oven by as much as 10⁰C. An additional patent is pending for the orifice-plate nozzle structures which eliminate the side-to-side and directional variance inherent in conventional nozzle designs.